Nordic-Style Watercolors with Swedish Artist Bjorn Bernstrom - Land O' Lakes Area Artisans, Inc. 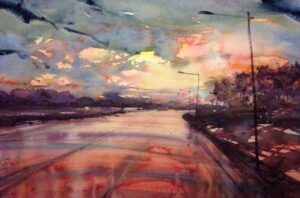 Learn the european approach to watercolor painting with award winning artist bjorn bernstrom of stockholm, sweden! Suitable for adults with some watercolor experience. Cost: $390.00 for the three days. Light breakfast will be served each day, with lunch served on the last day of class. Returning to LOLA for the 4th time, Bernstrom will work with experienced watercolor painters on expanding their artistic expression as he teaches his Nordic-style of painting. 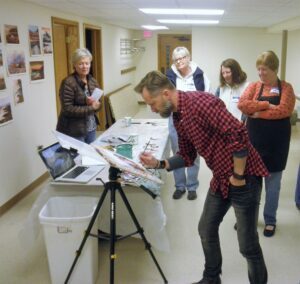 A workshop with Bjorn often means breaking the traditional rules of watercolor painting. Watch his technique of using layered washes and carefully chosen pigments to achieve dramatic color and textures that create emotion in rural landscapes or a day in Chicago. Two days of class will focus on landscapes and structures in Bjorn’s Nordic-style. The third day will focus on portraits. Students will also learn about perspective, composition, and how to get strong light into their paintings. Daily demonstrations will be done with “modern Nordic” watercolor techniques, such as blooms, bleeds, and pouring. Bernstrom will also discuss how certain pigments can be used in glazes and washes to enhance the impact of a painting. Students may bring their own photos to work from. Some experience is necessary for this workshop. This workshop will be held at the Ely Memorial Church basement, downtown Land O’ Lakes. Registration & Payment will be needed by September 26. No refunds will be given after the deadline. For questions, please call the LOLA office at 715-547-3950. Planning on staying overnight in town for a LOLA Class? 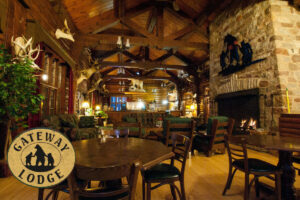 Then stay with our friends at The Gateway Lodge and received 10% off your lodging! Just mention that you are in town for a LOLA class or event at time of booking. The Gateway Lodge is located at 4103 Hwy. B Land O’ Lakes, WI 54540. Visit their website for more information about the historic Gateway Lodge and call (800) 848-8058 to make your reservation today!